Special Containment Procedures: SCP-3096 is to be kept in a standard storage locker in the High-Security wing of Site-██. At all times, it is to be exposed to an Einstein-Pálsdóttir Temporal Field (EPTF) with a temporal coefficient of +1.0125. Two redundant EPTF generators are to be maintained in the containment area and powered by batteries. Agent Graeme is to be protected from harm at all costs; to that end, he is to be kept in a High-Security residence at Protected Site-██. He may not be given any assignment in the field until the commencement of Operation Repulsion in approximately six months. He has been fully briefed on the contents of this document. For the sake of clarity, all documentation of events concerning the object or Agent Graeme are to be described in terms of their temporal relation to the present (e.g. "one year ago") rather than with a date and time. Agent Graeme is thirty-four years of age. 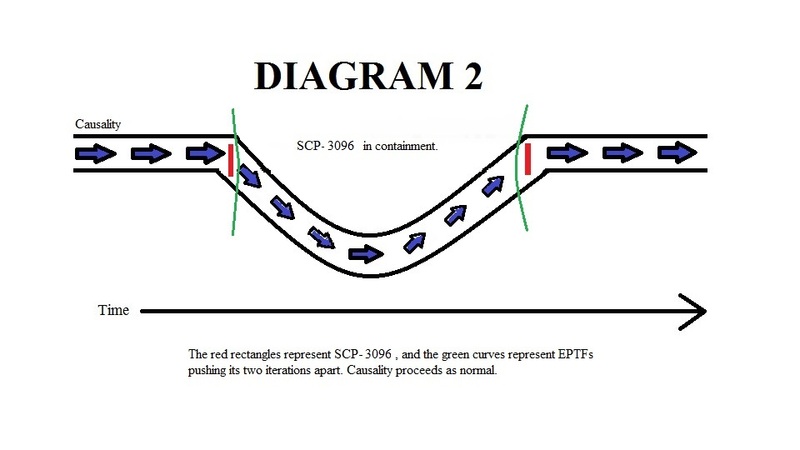 He is still employed by the Foundation, and has provided the Foundation with all of its information regarding SCP-3096 through a causal loop2 whose position in time is continuously changing. Ten years, four months ago: The Foundation detects a temporal anomaly affecting the baseline branch of causality. Investigation commences. Ten years, one month ago: The cause of the temporal anomaly is determined to be Agent Graeme, at thirty-five years of age. 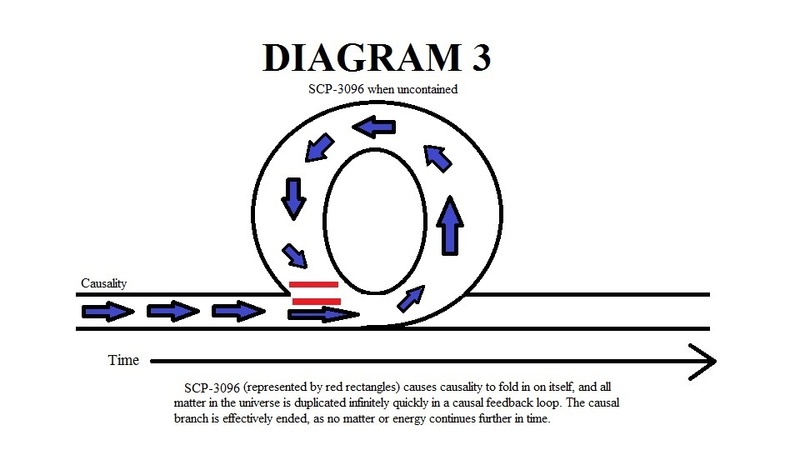 He has used an unknown, single-use anomalous object to travel back in time, with the purpose of recovering SCP-3096. At this time, there are two versions of Agent Graeme; one older and one younger (at twenty-five years of age). The younger version is not made aware of his counterpart's presence. Ten years ago: The older Agent Graeme recovers SCP-3096 and submits it to Foundation custody. He requests that this action be dubbed Operation Repulsion. Nine years, ten months ago: The interview documented in Interview Log 3096-Alpha is conducted. Six years, one week ago: One of the redundant EPTF generators disappears from the containment chamber under unknown circumstances. It is quickly replaced, and containment is not breached. Six years ago: The older Agent Graeme disappears under unknown circumstances.4 The younger Agent Graeme is briefed on the contents of this document and transported to his current residence at Protected Site-██. Seven months ago: Based on recommendations given by the older Agent Graeme before his disappearance, the EPTF generator is reset with a temporal coefficient of +1.0125.5 This is its current setting. Now: SCP-3096 is in containment. Five months in the future: An unknown anomalous object enters the Foundation's possession, allowing the younger Agent Graeme to travel back in time to the beginning of this timeline. Details about the exact nature of this object were withheld by the older Agent Graeme. Six months in the future: The younger Agent Graeme, at thirty-five years of age, is dispatched on Operation Repulsion. The following interview was conducted nine years and ten months ago. Dr. Pálsdóttir: Why is this item contained in the first place? Agent Graeme: I can see how that would be confusing. But it's a magnet, right? Agent Graeme: It's not only a three-dimensional magnet. It's, um, also attracted to the future version of itself, if that makes sense. Dr. Pálsdóttir: I'm not sure I follow. Dr. Pálsdóttir: That would be helpful. Agent Graeme: But what we need to worry about is what happens when the present and future SCP-3096 meet in the middle. Dr. Pálsdóttir: And what happens then? Dr. Pálsdóttir: Our branch of causality, you mean. Agent Graeme: Yes, our branch of causality ends, and folds in on itself. Imagine the planet Earth moving back into the past, again and again and again. Every atom of matter in the universe will do the same. Dr. Pálsdóttir: And what, fill the universe with an infinite amount of matter in no time at all? Agent Graeme: Exactly. Plus an infinite amount of energy. Dr. Pálsdóttir: I don't think I've ever seen a temporal anomaly quite like that. How do we even begin to contain it? Agent Graeme: Well, if I recall correctly, you're working on something related right now. Speeding things up and slowing them down in time, right? Agent Graeme: Not that I know how it works, but in the future where I come from, we slowed down the present— no, past— no, earlier version of the magnet by one eightieth, and we speed up the future version by the same amount. We'll call that effect an "Einstein-Pálsdóttir Temporal Field." Dr. Pálsdóttir: Where did you get that number? One eightieth? Agent Graeme: Some kind of paradox, where else? These are the three diagrams provided by the older Agent Graeme nine months and ten years ago. 4. His whereabouts remain unknown. Investigation into his disappearance is ongoing.